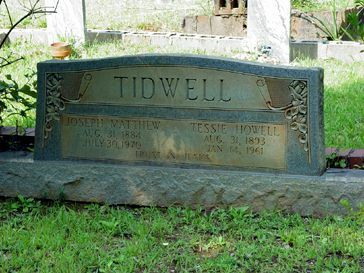 Joseph Matthew Tidwell, son of John Tidwell and Susan Abernathy, husband of Tessie Jerusha Howell. Tessie Jerusha Howell, daughter of Richard Howell and Susan Alice Elliott, wife of Joseph Matthew Tidwell. Joseph Matthew Tidwell of Yatesville, a former resident of Bartow County, died Thursday evening after an illness of two weeks. Survivors include three daughters, Mrs. Shirley Evans, Mrs. Dorothy Maddox, and Mrs. Sybil Boyd, all of Yatesville; three sons, Edgar and Jack Tidwell, both of Yatesville, and Edward Tidwell, Cartersville; 16 grandchildren, 17 great-grandchildren, and one great-great-grandchild; and a sister, Mrs. Dusky Vaughan, Fairmont. Funeral was at 11 a.m. Saturday from Macedonia Baptist Church with Rev. Willie Howell officiating. Burial was in the Old Macedonia Cemetery. Mrs. J.M. Tidwell, formerly of Cartersville, passed away at her home in Yatesville Saturday after a lingering illness. The former Miss Tessie Jerusha Howell, she was the daughter of the late Mr. and Mrs. Richard Howell and was born in Cherokee County August 31, 1893. Survivors include her husband, three songs: Edgar Tidwell, Yatesville; Edward Tidwell, Cartersville; Jack Tidwell, Thomaston; three daughters: Mrs. Thomas Evans, Mrs. Bill Maddox, Mrs. Walter Boyt, Yatesville; 16 grandchildren, nine great grandchildren; a brother, Jess Howell, White; four sisters: Mrs. Tom Abernathy, Mrs. Silas Harden, Cartersville; Mrs. Elihue Abernathy, Adairsville; Mrs. John Abernathy, Austell. Funeral services were conducted Sunday at 1 P.O. at the Macedonia Baptist Church with the Rev. Willie Howell and the Rev. Bartow Abernathy officiating. Burial was in the Church Cemetery with the Owen Funeral Home in charge of the arrangements. Her husband was Joseph Matthew Tidwell.